St. Patrick’s Day 2012 will be upon us in just a few short days, which means that all eyes in Walt Disney World are upon Raglan Road. But what about the quick service location attached to the side of the restaurant, better known as Cookes of Dublin? 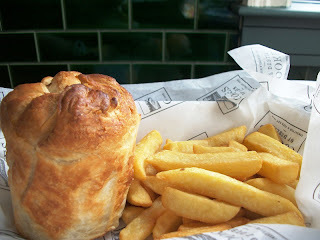 Well, if we’re looking to celebrate without attending a big party, Cookes of Dublin certainly has the pies! The meal of choice was the Chicken and Field Mushroom Pie which comes with a side of chips, aka French fries. All of the pies at Cookes of Dublin are made from scratch each day. The freshness with which everything is prepared here means that there is going to be a stretch of time between when you place your order and when your food is ready. In other words, it may not be as fast as a typical quick service counter, but you are also not going to wait as long as you would at a traditional sit down restaurant either. How is the pie? The top crust is light and flakey, while the crust that wraps around the pie is soaked with the pie’s gravy, making it chewy and buttery. The filling is large chunks of white meat chicken mixed. Also at the pie party are large segments mushrooms, leeks, and potatoes. The creamy sauce makes sure that all the flavors are equally distributed across the tastebuds. The pie is earthy and hearty and right in my comfort zone. 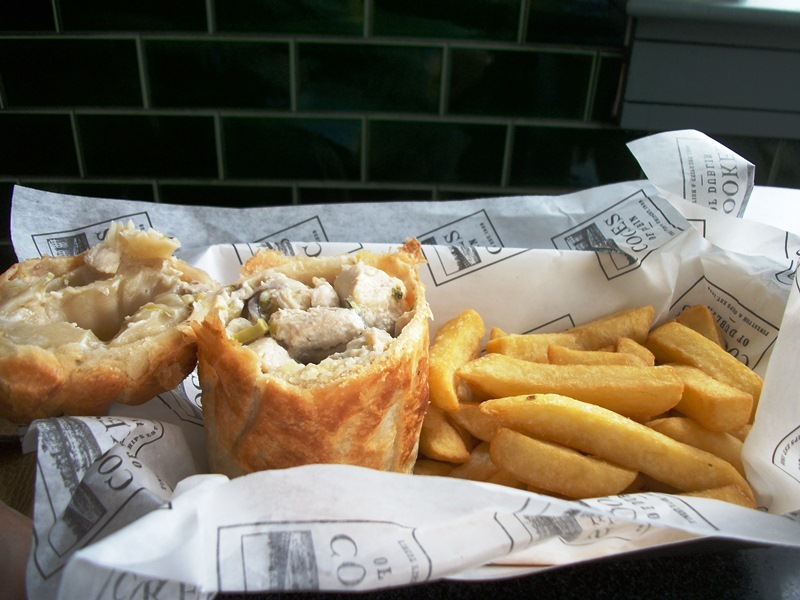 If you are looking for something a bit different this St. Patrick’s Day, or maybe just something to sop up some of that Guinness in your belly, you would do well to heed my advice and pick up a Chicken and Field Mushroom Pie from Cookes of Dublin. Oh, and if you’re wondering about the title of this article, it comes from John A. Cooke himself.